Taking part in a ribbon cutting for the new Boone Central facilities Tuesday were, l.-r., Middle School Principal Tanner Schutt, Education Commissioner Matt Blomstedt, Elementary Principal Jimmy Feeney, Superintendent Nicole Hardwick, Board President Patti Meyer, Board Members Darren Wright, Tim Stopak and Ed Knott, and High School Principal Erik Kravig. At a dedication ceremony Wednesday, Nov. 22, for the Boone Central Schools construction/renovation project, speakers saluted many for being dedicated to making the improvements a reality. 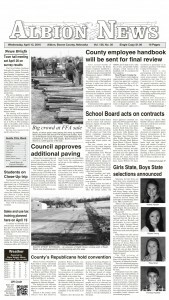 School Board President Patti Meyer recalled the earliest efforts in 2010-11 to plan for a school construction project. Many hours were spent by the board, administration, staff and project supporters in developing the bond issue proposal that eventually was passed in 2015. Meyer also saluted the custodial staff, faculty and students who helped move all classroom materials and furniture out of the elementary in May of 2017, and then move everything back in for the start of school last fall. She expressed appreciation to Sampson Construction, the general contractor, subcontractors, architects Bahr, Vermeer & Haecker, and financial consultants D. A. Davidson & Co. She commended the work of former Superintendent Dr. Cory Worrell and former school board members on the project. Meyer also called attention to several items inside the 47,000 square foot addition, including the new digital scoreboard in the gym, that were made possible through the sponsorship and support of area businesses and industries. 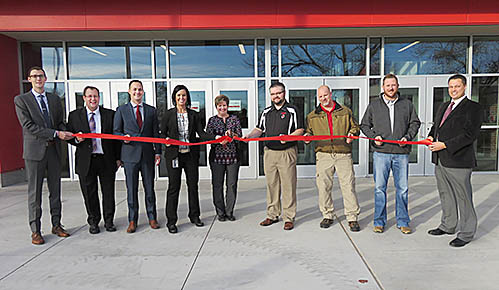 Dr. Matt Blomstedt, Nebraska Commissioner of Education, congratulated the school and community for a dedication to education that he said is evident in the new facilities. Blomstedt said he believes Nebraska feels a responsibility to the children of the state, which shows in education. “They (the children) are our future,” he said. In the keynote address, Arnie Johnson, former Boone Central teacher and coach, said he asked about the characteristics of the school’s students when he came to Albion Public Schools in 1987. He was told they are hard workers, have a positive attitude, and take pride in their school and community. Johnson said he found those assessments to be true, and the school became even better and stronger when Albion and Petersburg merged into Boone Central in 2001. Jimmy Feeney, elemtentary principal, served as master of ceremonies. Supertintendent Nicole Hardwick, High School Prinicpal Erik Kravig and Middle School Principal participated in the ribbon cutting. School board members Darren Wright, Tim Stopak and Ed Knott also participated in the ribbon cutting. Board members Justin Frey and Dr. Sean Kohl were unable to attend. Boone Central drum line and cheerleaders performed to close the program. Tours were provided for the public throughout the morning, and the school’s one-act play team performed its play, “By Zeus, Olympus’ Got Talent,” in the performing arts gym. Details in the Nov. 29 Albion News & Petersburg Press, Print and E-editions.